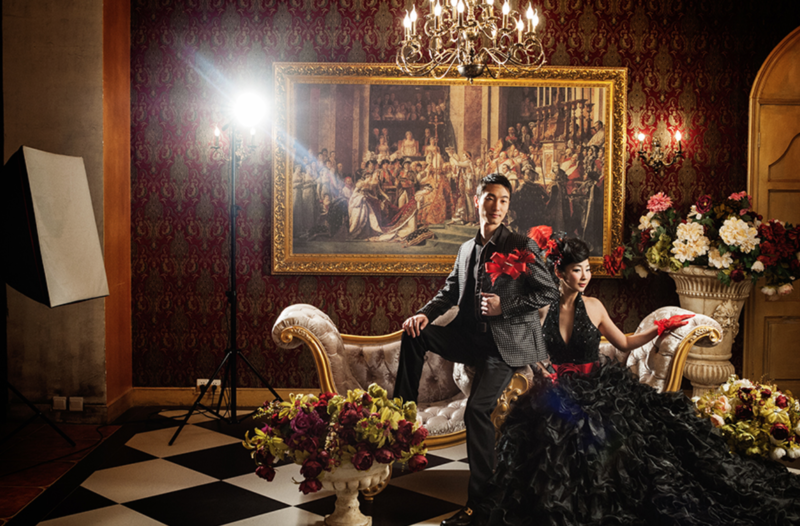 Following the abandoning of Mao’s policies and the embracing of a consumer economy, professional wedding portraiture has become popular practice for Chinese couples. However, their portraits differ from those in the West because they are not candid shots taking during one’s wedding. Rather, they are elaborate photos taken in a studio on a day other than the wedding and in some cases long after the marriage has taken place. The goal of these portraits, as the following images will demonstrate, is not to capture romance between the couple. Instead, it is project a series of potentially false images about the couple: affluent, cosmopolitan, educated, western, or even that they are in love. The image above features a woman in a wedding dress seated beside a man in a suit, presumably her husband, in an exotic red sports car set in a city. Above them is the phrase “Don’t forget to be continue” below “Creation&Journey.” Upon closer examination, it becomes evident that neither the bride nor the groom’s clothing fits them properly. The shoulder pads of his jacket extend far beyond his shoulders and terminate well above his arm, as evidenced by the bunching up of the material when it should lay naturally. Furthermore, how the jacket hangs on his frame indicates that it is meant for a man much larger than him. Likewise, her gown seems to be intended for a woman much larger than herself. The sleeves of the gown bunch up when they should lay flat when her arms are by her sides and the shoulder straps are elevated off her shoulders. An English speaker should also not that the phrase “don’t forget to be continue” does not make sense. What these small details illuminate is that this is an intentionally fabricated image designed to convey a false level of affluence. A couple that can afford an exotic Italian sports car like the one in which they are depicted can also afford clothing that fits properly, especially for their wedding celebration. However, wedding portrait studios typically provide clothing for the portraits. The ill-fitting clothing coupled with the incoherent sentence above them suggests that they went to a cheap wedding studio. A sophisticated consumer spending lots of money on these portraits might have enough exposure to English to realize that sentence did not make sense. If not the couple depicted, then the other sophisticated clientele of the upscale portrait studio would have pointed it out to the photographer so that this mistake would not appear. This illustrates that a desire to project affluence transcends class and includes those for whom such levels of wealth are little more than a dream. Unlike the photo above, this is a photo of a wedding portrait’s being set up. We can see in the background the dirty concrete walls of the studio, as well as the studio lights behind the couple and beside them. Behind them is a western painting depicting a Christian scene. The couple is wearing Western clothing as well: a flowing black evening gown and an elegant suit coordinated to match her dress. They are seated on a French style couch and are flanked by European style vases, the furthest of which depicts the Greek gorgon. Above them is a chandelier. As with the previous photo, this one shows the process by which an artificial sense of opulence is created. The bare concrete wall on the left side of the photo is dirty and covered with mold, hardly indicators of opulence, and it clashes quite vividly with the colorful scene around them. Both the floor and shape of the wall suggest that this is a contained “reality” whose truths do not extend more than a few feet. However, this couple might be more affluent than the previous couple as the studio’s attention to detail is far more acute than the previous studio. Not only does her dress perfectly match his suit, but they are also complemented by the floor itself and are balanced elegantly by the shadows cast by the studios lights; neither of their costumes glaringly clash with the scene around them as the man’s suit did above. Furthermore, both of their costumes appear to fit them properly, which also suggests that they are more affluent than the other pair. The incorporation of Western paintings and ancient Greek symbology in the form of the gorgon on the vase suggests that the couple sees Western history as a commodity that can be used to express wealth rather than just Western cars or clothing. In conclusion, both of these photos illustrate a cross class desire to project false realities in Chinese wedding portraits. When juxtaposing the first and second image, attention to detail by the photographer in terms of how the clothing fits the subjects demonstrates that these photos appeal to poor and rich consumers alike. The second photograph illustrates the extent to which these photos are fabricated: a gorgeous, European-style background in a filthy, mold covered photo studio. Both photos through their use of European decor and the first’s use of English demonstrate a desire to commodify Western culture to project a false cosmopolitan nature. introduce “Western decor and Chinese application in wedding portraits” as thesis statement at the beginning. In so doing, your analysis will be driven by potential explanation of why so. This entry was posted in The Commercial - Wedding Gown & Beauty Economy on April 13, 2016 by ribanez. Louisa Schein in The Consumption of Color and the Politics of White Skin in Post-Mao China, argues that the representation of white women overwhelms the contemporary Chinese world. She continues this argument by observing the denotations and connotations of the white woman’s body and facial features and attributes. Stein gives us 2 symbolic meanings of the western woman. The first being the physical meaning, the second being the ideological meaning. The physical meaning is the “emblem of radicalized difference which signifies not the blondness (or paleness) of western physical taxonomy”, but any color lighter than jet black or tan skin, which has unequivocal connotation of value. The ideological meaning is that the “White woman’s body has been written over by a multitude of other meanings including freedom, individualism, democracy, and progress. The white woman, or the western woman, that is featured in many Chinese advertisements denotes a soft, pale face, with a curvy body that not only insinuates sexuality, but also wealth and success. These connotations of the western woman developed a fetish for many Chinese women who also wanted to represent these ideas that, in their minds, couldn’t be achieved through Chinese fashion and culture. Lighter hair was also a cosmetic desire western women had that was sought out by Chinese women. Lighter hair in addition to lighter skin meant that you had more beauty value than if you had darker skin and hair. Location, in other words, depending on where a Chinese woman is from, greatly effects whether or not Chinese women have access to the makeup that allows them to replicate the image of the western woman. Women who live further from cities and work outside a lot have darker, tanner skin as opposed to women who live close to or in cities that, due to less exposure to the sun, have paler, whiter skin tones. Therefore, the paler face connotes wealth in China because if you are wealthy you don’t have to work outside, if you have to work at all. This is an attractive aspect in China because it is the revival of femininity since Mao’s socialist China, where women were asked to be more masculine than feminine. However, although paler skin is the desirable look for Chinese women, it is mainly to attract and entice men. In the photo to the left, there is a fair skinned, light-haired, young, western female posing for an ad advertising makeup. It’s clear that this woman is a model and has very attractive facial features that draw consumers to immediately stare at her beauty. Sometimes this stare can become a gaze of envy. Her bright blue eyes draw the consumer in like a black hole. Her skin is soft and if you look close enough, her skin is shining a little. Her skin in contrast with the white backdrop shows that she truly has a pale skin tone. Once the consumer has taken in all of this model’s beauty, the eyes immediately look for what product made this woman look this way. The make-up container that is juxtaposed to her face is the center of the photo, sharing an equal amount of focus with the actual model. The containers label says “CyberWhite, Brilliant Cells”. Because the container says “CyberWhite” on it, the ad is selling the luxury of having paler, whiter skin, as opposed to tan, darker skin. This ad is a perfect example of what Schein means when she says, “the passion for the Western Woman is a panacea, one that provides a focal point for Chinese longing and one that, in the process, effaces the subjectivity of Chinese women as women.” (Pg. 145) In this quote, Schein points out that the image of the Western woman is a solution for all difficulties faced by Chinese women to present themselves as “beautiful”. Furthermore, that this image of Western women makes the Chinese woman appear insignificant in contrast to the Western woman’s beauty. This explains the fetish that not only Chinese women have to be like the Western woman, but also that Chinese men have to desire the depiction of the Western woman. This is the reason why many Chinese women sought to lighten their skin tone, hair, and sometimes even change their facial structure to replicate the image of “Beauty” in reference to the Western thought for female beauty. This entry was posted in The Commercial - Wedding Gown & Beauty Economy on April 13, 2016 by ejiu. This photo is a screen shot from a Chinese breast enhancement advertisement. The ad was shown on the Ellen DeGeneres talk show. In the advertisement, women put on the bra like device that is meant to be pulled in repeatedly. This action of pulling the breast together is said to bring other fat from other areas of the body to the breast region. On the Ellen show she mocks how implausible this process would be in effectively enlarging the breast. This begs the question, why are the Chinese willing to try ridiculous things in order to enlarge their breast? When did this obsession start? During Mao’s China the feminine body was meant to be hidden or just not prevalent. This is because in communism everyone is put at the same level. Both genders wear the same things and are required to be able to accomplish the same tasks. After the fall of Mao’s China came the emergence of western culture to Chinese culture. Chinese women saw that western women had larger breast. They affiliated large breast with the more, at the time, advanced western society. Large breast were then seen as a sign of a high level of civilization. Large breast was a point of liberation for Chinese women. By having more feminine features they separate themselves from past Mao china ideas. They use large breast to free themselves from the constraining ways of a communist government. A way that Chinese women differ from western women is in the reasons behind enhancing their breast. In western culture most women get breast enhancements is to please their male counterparts. Westerners get breast enhancements in order to please others and conform to societal guidelines on how an attractive woman should look. In Chinese culture women get breast enhancements in order to please themselves. (also to meet male and social desires) In advertisements the male gaze upon the women is not prevalent. Ads focus on how the woman is pleasing her own desires. Chinese relate breast to being mature. Once the breast have size the women has bloomed into her whole self. It is interesting to see the comparison between “the why” between western and Chinese culture for getting breast enhancement. In terms of breast enhancement it is clearly a case of the West entering into eastern culture after the time of Mao’s china. Past that point there is a variation between the reasons why the women want enlarged breast as see above. nice to compare the fashion of female body between mao’s and post mao China with west as the model. This entry was posted in The Commercial - Wedding Gown & Beauty Economy on April 13, 2016 by cpratt. Advertisement on the left taken from Vogue January 2013, advertisement on the right taken from ICON magazine 2015. These two advertisements were taken from women’s magazines in China, the one on the right was taken from ICON magazine a Singaporean fashion publication that has been locally established throughout China and the one on the left was taken from Chinese Vogue. In their article, Frith and Yeng describe the difference between locally based publications and multinational publications with a foothold in China. In their estimation, while both groups of publishers rely on advertisement, local publications rely more heavily on mass circulation, while international publications such as Vogue rely on advertisement to secure revenue. Owing to this difference, many local publications have a slightly less high end quality to them, specifically they cater to lower to middle class women while international publications cater to higher class women (1). The difference in these two advertisements, when considered in this context, demonstrates the notion that beauty is a class issue in China and a woman’s ability to conform to beauty standards depends on her ability to afford self alterations. 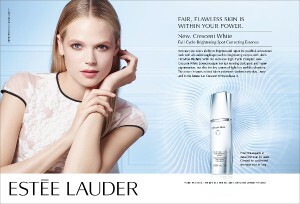 Content of the advertisement: The advertisement on the right shows a product that alters skin appearance making it appear younger and more pale. 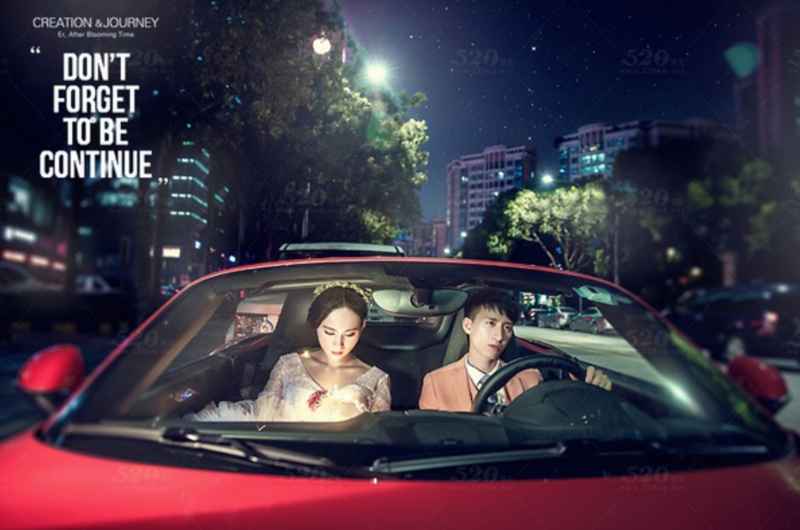 The advertisement is cluttered with information about price and how to obtain the product, which presumes that people to whom this advertisement is targeted, lower to middle class Chinese women, would seek this product out and use it. why? This is in direct contrast to the advertisement from Vogue, which provides no information about the product, in fact it is not clear exactly what product (the dress or the bag) the advertisement features. The name of the company figures prominently at the top of the advertisement but there is no price, store location or phone number. This suggests that this advertisement is not directed at clients who will expressly seek out the product and use it, but rather it is selling a way of life or a persona. In other words, the advertisement presumes that upper class have everything they could need to be beautiful and now are just looking to personify a way of life associated with this beauty. Choice of models: The difference in the two models further demonstrates the connection between class and beauty. The model on the left appears both younger, specifically because of her “baby face”, and more pale than the one on the right. This fits in with the obsession with paleness and the notions of nennu and shunu that seem to be central to the Chinese notion of beauty. The simple fact that the advertisement targeted towards wealthier women displays the two main ideals of Chinese beauty while the advertisement targeted towards lower to middle class women seems to be striving for these ideals without actually attaining them demonstrates that beauty and wealth are strongly connected, particularly when self-alteration seems to be such a widespread beauty ritual in China. In conclusion, the difference in the layout and content of the advertisments as well as the models themselves, clearly demonstrates the trend that while lower and middle class women seem to constantly strive to meet beauty ideals with various products, upper class women have the resources alter themselves and meet these standards, making beauty a fundamentally class based issue. (1)Transnational and cultural flows: An analysis of women’s magazines in China, Frith and Feng. Chinese Journal of Communication. 2(2) July 2009, 159-173.
both statement and structure are clear. The issue of class could be further investigated. This entry was posted in The Commercial - Wedding Gown & Beauty Economy on April 13, 2016 by sberube. In this two-page skin beauty advertisement titled “Skin Genesis (L’Oréal)” in a 2010 U.S Vogue Magazine include two celebrities Eva Longoria and Kerry Washington. They have different skin tones and are photographed for an advertisement for a “complexion equalizer” that is able to provide you with the best looking skin. This advertisement is promoting the beauty of minority women, in this case Latinas and African-Americans; but most importantly the “attainable” beauty “ideal” of a young and flawless looking face which is also an ideal for women in China according to Qinwei (Vivi) Xie and Meng Zhang’s case study. In this first page of the advertisement the “natural” beauty of these two women consists of having a flawless and non-white skin tone. The viewer can see that they do not have any acne or anything other mark that could ruin the flawless looking skin. Authors of the case study, “White or Tan? A Cross-Cultural Analysis of Skin Beauty Advertisements between China and the United States,” Qinwei (Vivi) Xie and Meng Zhang conclude that advertisements represent the “ideal” appearance of the skin within a country. Having a non-white skin tone was not always desirable in the U.S, but it was not desirable in China. In the 1920s Coco Chanel reproduced tan skin as a trend, so skin beauty advertisements marketed to women in the U.S till this day have women with non-white skin tones. 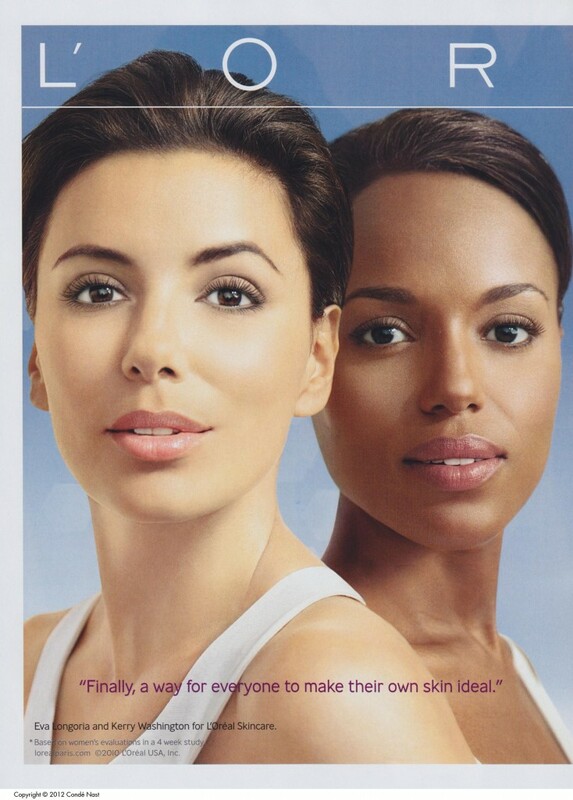 Although in this advertisement both women do not have tan skin, it could symbolize the fact that some Latina and African-American women do not need to be tan because their skin color is naturally non-white or pale. Lastly, the statement at the bottom suggests that having non-white and flawless looking skin is the perfect combination. This advertisement could possibly been one of the advertisements that was used in the case study because it is within the time frame the authors studied which is why I chose it. the visual advertisement well delivers its message of ideal appearance with non-white skin. Do explain why the non-white as model for the potential Chinese consumers? Any social, gender, ethnic indications? Xie, Qinwei (Vivi) and Meng Zhang. “White or Tan?,” in Asian Journal of Communications 23, no. 5 (Routledge: 2013) 538-539. 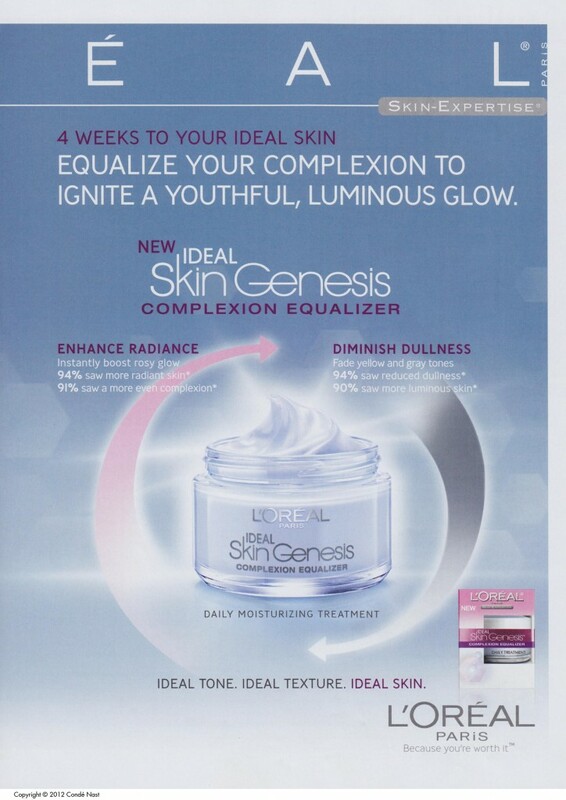 On this second page of the the advertisement it does not only show the actual product in a spotlight, but the words and statements used assure young and flawless skin. The advertisement includes statistics in the shape of a graph to show that the process is trustworthy, but also simple. Also states things like “4 weeks to your ideal skin” and the slogan especially “because you’re worth it.” Not only does this advertisement advertise unrealistic expectations for a woman’s skin to look like naturally, but it also makes beauty equivalent to a woman’s worth. Having flawless skin is an easy way for society to value women because it is just based on appearances. denotation of text and connotation of its message: how does the ad convey its message? let the questions of how the ad draw viewers’ attention and why lead your analysis rather than description. For instance, why minority/colored women as models and why the textual messages? This entry was posted in The Commercial - Wedding Gown & Beauty Economy on April 13, 2016 by mmendoza. 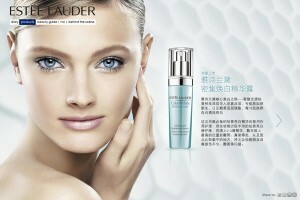 Across the world, beauty advertisements are the reason for some of the most top selling products. Although cultural differences may vary the brands, many of the products sold are quite similar in their purpose. In our studies, we see that skin-whitening cream is quite common, especially in China. The goal is to look and be more like the Caucasian Westerners, who seem to symbolize success in all areas of life. This advertisement presents skin whitening cream as one way Chinese people (and other buyers) can achieve this “white success.” By using English text, the zipper effect, and a removal of blemishes, the advertisers claim to give the buyers a glimpse of what it is like to live like a white Westerner. The advertisement sells false perceptions of whiteness and the product itself to trick its consumers into buying more of the product. Its advertisement assumes that achieving whiteness is the ultimate goal. Chinese Beauty Advertisement for Johom “Pure and Natural” skin whitening cream. The zipper on the woman’s face in the advertisement is one of the first things the consumer will notice on this ad. It is unzipping the woman’s outer skin, revealing a whiter, smoother skin below to get rid of the outer, blemish-filled, darker skin. From this visual, we can assume that the skin cream is advertising the revelation of a better, newer you. By using their product, they are claiming that your skin will be better in all aspects, but most importantly–white. The advertisers use the zipper as a way to force the consumers to believe that their product will give you the skin lightening you want. It is as if you must remove your darker layer in order to achieve the inner layer that you want–whiteness. The advertisers are insinuating that everyone has a deeper inner whiteness than can be achieved by the product. By assuming that every consumer wants to remove some sort of “darker” layer for a lighter one implies that whiteness is the ultimate goal for beauty standards. Removal of Blemishes any critical claim that can make? The beauty advertisement uses the zipper to show the transformation from dark to light skin, but also includes the removal of blemishes and other unfavorable facial attributes. The whiter complexion does not seem to have any marks like the darker outer layer. From these denotations, I can see how the lightening of skin is now implied as an even more favorable trait. The advertisers are claiming that not only does the whiter skin “look better,” it also removes unwanted blemishes to produce clear skin, even though this is not even in the product description. It is clear that the product’s purpose is to whiten the skin, but the removal of blemishes insinuates that looking whiter means more beauty overall. The advertisers are selling the product to reproduce the social claims that whiteness is better for every part of your skin and life. The advertisement presents English text as the only font on the product. However, my research on the product indicates that this product is made in China with natural herbal ingredients from its home country. From this observation, we can assume that this subtle change was not an accident. I believe that the connotations of the switch of language are an indication of the market the sellers are trying to advertise. The skin whitening cream is marketed to allow its buyers to look more like the Caucasian Westerners, and the English text only reaffirms how much closer the buyers will be towards a more “Western” lifestyle. The buyers of skin whitening cream would be attracted to the product’s the devotion to be more like the Western Caucasians, which would then get them to buy the product. The switch of the English text could even trick the buyers that this product is from America, even though this is not true. I believe that the English text was a subtle trick to increase sales by the advertisers. By sending misleading messages in its images, the advertisers sell a product that falsify its effects and reproduce unattainable beauty ideals of whiter skin. The subtle messages of the zippered skin, English writing, erasure of blemishes, and many other aspects of the advertisement are ways that the advertisement sell consumers an unhealthy, unattainable beauty ideal. The consumers are only forced to believe that whiteness, specifically Western Caucasian whiteness, is the highest form of beauty through the product itself and its advertisement. nice subtitles. explanation could sound more critical. This entry was posted in Fashion and Gender in China, The Commercial - Wedding Gown & Beauty Economy on April 13, 2016 by Rebkah Tesfamariam '18. These images above are both advertisements directed at the women of China. The first is from the time period of Mao’s China and the second is 20-30 years post-Mao China. During Mao’s China the Chinese people were told to value Chinese made good. In fact the Western world was looked down upon, and there was no sense of emulating the west in any ways. What was truly valued was equality and hard work. 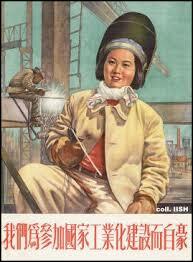 In the first advertisement the woman is seen hard at work, and happy about it. However she is depicted as a female who has a very masculine build. The clothing she is wearing also makes her look more masculine, as it looks large and drape like and shows no womanly curves. However this make sense for how women were seen during Mao’s China, not really as women but instead as an equal to men. When Mao died and his reign ended China “entered into the world”, especially commercially. There was an increase of western advertisements and products flowing into China. When before the Western world was though of as nothing worth emulating, no the Chinese came to see certain aspects of the West and started to value them. One in particular is the fascination with the Western woman’s “large and free breasts. need to make a critical statement: what does the large breasts suggest and why Chinese women are crazy about that? Once China moved out of Mao’s rule, the woman in particular came to value their bodies more. However they came to see them through a Western view and though that they needed to become like the West to truly be feminine and be considered beautiful by the world. what does the change suggest? The second image is from a Chinese advertisement that promotes a breast enhancement bra that will give woman larger breasts, more Western looking breasts. The fist picture shows a woman looking down shyly at her breasts. Her body language shows as though she is shrinking away from the camera, and is wondering where her breasts are. The second picture of the woman shows her chest confidently, looking directly at the camera with a massive smile on her face as she proudly tightens her bra. This new fascination with the Western body and more specifically the Western woman’s breasts is seen heavily in the Chinese media. Most of the advertisements in China are western models so the Chinese women see this Western beauty and start to want it, because that is what they start to think of as beautiful. Women are starting to go to drastic lengths to obtain a something that they are told to believe is beautiful. All of the constant advertisements are making women look at themselves an see their body through another cultures eyes, they do not see themselves as feminine or beautiful because they are different. do we see anything western from the ad? let two questions guide the analysis: how does the ad delivers its message and sell its product (denotation) and why so. This entry was posted in Fashion and Gender in China, The Commercial - Wedding Gown & Beauty Economy on April 12, 2016 by mfichter. Source: Cancan Chu/Getty Images News: “Miss Plastic Surgery Finals,” 2004. Beijing, China. The image above, titled “Miss Plastic Surgery Finals” portrays the winner of a beauty pageant in Bejing, China, Feng Qian. The pageant is not what one would consider a “typical” beauty pageant, however, but a competition for Chinese women who have received extensive plastic surgery. In this image, Feng Qian celebrates her victory amongst a colorful downpour of celebratory confetti. She smiles proudly while holding a red book and cloth above her head. Author Erica Swallow explains how the philosophy behind the beauty pageant is that “all ‘ugly’ women can become beautiful with the wonders of man-made beauty” (Swallow, 7). 1) Plastic Surgery: Considering that China hosted its first annual Miss Plastic Surgery beauty competition in 2003, one can contemplate how the quest for beauty has become increasingly popular in China. The propagation of beauty standards has directly impacted the Chinese woman, evident in more than makeup and beauty products, but surgical beautification. Surgery suggests permanency, causing one to consider the lasting effects of beautification on Chinese culture and society, in addition to the feminine body and psyche. The image also causes the viewer to consider what types of cosmetic surgery Chinese women are opting for. One may perceive that Chinese women are choosing surgeries that convey a more western appearance (need evidence or explanation), suggesting how a psychological inferiority complex may be present between the Chinese woman and the western woman. (Swallow, 1). 2) Confetti: Swallow explains how “rather than accepting themselves as Chinese and embracing their natural beauty, young women are seeking medical treatments and beauty enhancements to make themselves appear more foreign” (Swallow, 1). Rather than admonishing these beliefs and re-defining them amongst the Chinese youth, both Chinese and western influencers have celebrate an unnatural standard of beauty through advertisements and societal rhetoric. In the image, the raining confetti can be viewed as symbolic of how foreign beauty has been celebrated while “ugliness,” and natural beauty have been societally condemned. confetti: celebration of surgical beauty rather than natural beauty: indication? explain “western influence”: how the image suggests the influence? 3) Red Book: The red book that Feng Qian holds reminded me of the Maoist red book utilized by the Red Guard movement. The red book in this image stands in ironic contrast to beauty ideals during the Maoist period. During the Red Guard period, wearing beauty products was frowned upon as it undermined the Communist philosophy of standardization amongst people. It is ironic to consider, then, how plastic surgery as perpetuated by the beauty market, has, in a way, “standardized” beauty in a very different way. Beautification has pushed people not to look different, but to look similar in acceptance of uniform beauty standards. 4) “Audience”: One might also begin to consider who is “behind the camera”; not the photographer, but the audience at the event. This may lead one to question who is supporting such standards of beauty at the small-scale, local level, and further, at the commercial, global level. One may consider beyond who is “behind the camera,” and consider, further, “who is behind the face?” The molding of a new face is more than the work of a plastic surgeon, but the doing of various advertisements and a standardized rhetoric for feminine beauty. The image ultimately displays how foreign standards (does the image suggest foreign standards, if so explain) of beauty have been promulgated and celebrated by both Chinese society and the western beauty market, creating a psychologically harmful standard of beauty amongst the Chinese female population. Further, a new standardization of feminine beauty has emerged in contrast to the Maoist period. This entry was posted in The Commercial - Wedding Gown & Beauty Economy on April 12, 2016 by swallace. First Glance: In this photo taken in 1980 we can see the distinct fashion trends that had taken over the industry in China. The title of the photo, by Li Xiaobin, is Young People in Fashion. From the title, even someone divorced from the fashion trends of the 80’s can tell that these young adults are dressed stylishly. Even today these outfits would be considered to be fashionable, if not a bit outdated. Outfits: The two women and man in the photo are all wearing several layers of clothing that make an overall appealing outfit. The man is wearing a beautiful, and probably designer coat from an American designer, Ralph Lauren or Tommy Hilfiger. He layers underneath it a turtleneck, which was the essential 80’s men’s (and women’s) fashion choice. The color of his jacket it both neutral and bold. His hair cut is similar to many American men’s haircuts. The woman at his side is wearing a trendy leather trench coat. She pairs it with a gorgeous scarf that, planned or unplanned, compliments both her male counterpart’s jacket as well as her own. Her own cream turtleneck under the jacket indicates the common 80’s trend. Her hair is in a flouncy ponytail, probably very voluminous in the back. The third woman is wearing what looks like a velvet or corduroy, maroon jacket. She also is donning red gloves. Red was a huge fashion trend in 80s China and nearly all women wore red in some way in their outfits. 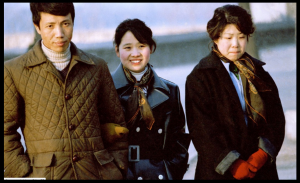 Subjects: These three young Chinese adults all look at least moderately well off. In the U.S the 80s saw the birth of the “yuppie” generation. Young, college-educated, professional adults who lived in cities and spent their incomes on material goods, being the culmination of several previous generations hard work to provide prosperity. These people all look very well to do, and are certainly at least middle class if not upper class. Li Xiaobin, Documentary Photography 1976-1989. Young People in Fashion (1980). without a thesis argument, the analysis could be misled by description. How about the thematic claim of fashion in transition in the 1980s? Then support the theme with denotations/connotation of the photographic image? This entry was posted in The Commercial - Wedding Gown & Beauty Economy on April 12, 2016 by mzegarra.